I agree with President Trump on just about everything, but I do NOT agree on another escalation of hostility in Syria, especially in view of the may atrocities that have been committed by the rebels and blamed on Assad. I do not believe for a second that Assad did this. He has the upper hand in this fight. We, the US, are the ones backing a den of snakes. You need no more evidence of that than the fact that John McCain loves them. It has been proven before that the rebels gassed their own people and blamed Assad. This is simply the most recent example. 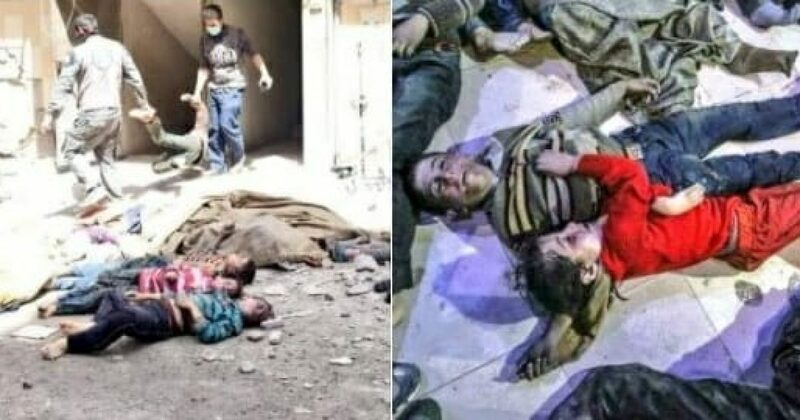 As can be evidenced in the photo, above, the rebels are staging the bodies of children for the Western media to incite global rage against Assad. I believe this is another case of President Trump receiving faulty intel from his own people. Remember, many in the intel community are holdovers from the administration of Barack Hussein. Assad had no motive to commit this atrocity. He was a happy eye doctor in Britain who was forced into the presidency when his heir apparent brother was killed in a car accident. Assad has been a secular leader who has gone to great lengths to protect large populations of Jews and Christians in Syria. I do not believe that Assad is to blame for the attack. President Trump should back off until a thorough investigation into the attack has been completed. Then, we should get completely out of Syria, as President Trump promised he would do a week ago.